What is employer branding? Should it be combined with employee branding? When companies and HR departments talk about employer branding, it is usually intangible and “trendy” talk on social media and in events, and cool videos. On top of that, an employer brand is often a corny and polished view of the company – much like any consumer advertisement out there – and it does not actually reveal anything to the potential applicant. 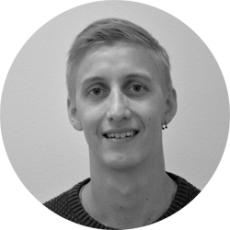 This leads to a situation where the most interested job applicants would like to ask for more information from the current employees, which is a good approach, though seldom done. Wouldn’t it be easier and more informative if your employees already actively shared news, content and insights about company happenings online? An employer brand is usually defined as the message for or perception of a company to the talent they are seeking for. But why would you want to differentiate the employer brand from rest of your brand and the efforts you do to boost branding on a company-wide level? Isn’t it best employer branding to have professional salespeople adding value to their customers and networks, or the best customer service on the market, or the most skilled tech team working on your product and sharing their knowledge on different forums? When- and wherever people meet and interact with your employees or brand – that is employer branding and what you should focus on. When you think about it, all employees are actually building your employer brand. Now it is only a question of how you can make that as efficient, easy and rewarding as possible. Knowledge about the company in real time. It is sometimes shocking how little employees know about the company’s vision, mission and values. Even more shocking is that people tend to find out about company news from newspapers or articles posted by third parties, not from the company. Goals and motivation to drive them. Quite often, people align their personal career and life goals with their work. Ideally, these goals would match seamlessly. The company should, at least, help employees succeed in their position as well as support them in reaching their other career goals. When employees can trust the employer in this regard, they will be more motivated in their work, which will surely be reflected externally. The possibility to express themselves. People need to be able to be themselves and proud of what they do. When employees are encouraged to express themselves and they can feel safe in doing so, this will support internal and external communication. With these steps, you can already lay out a foundation where your employees can be a positive reflection of your company brand as a whole. Now you should focus on getting that brand out in the open for everyone to find out about. Once you have accepted the fact that employees create your brand and that you need a proper foundation for engagement, you can start to build your company brand effectively through your employees. Note: this does not mean taking advantage of your employees but creating a mutually beneficial communication path for both parties! Essentially, all your employees want to succeed in what they do, and thus they’ll want to brand themselves in order to proceed in their career or improve in their current role. Branding oneself is about sharing useful information to others to position yourself better. This is made a whole lot easier with a tool where employees can find, create, share and discuss relevant content or information. Once your employees are able to use this sort of platform, it will not only result in better internal communication and information transfer but also in the possibility of employees being able to easily represent themselves and the company when they share that information to their own networks. It’s also essential that employees can contribute to this content. So you might as well crowdsource content production and sourcing by having your employees propose relevant content for others to read and share. When they actively produce company content and share it to their networks, your whole company brand is in great hands! Long story short – this is pretty much what our clients do and what we do at Smarp through our SaaS platform. 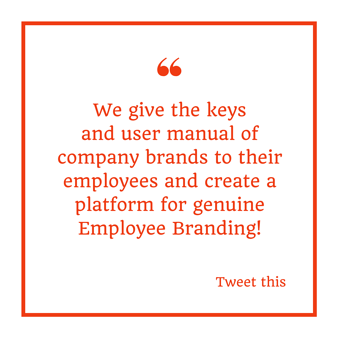 We give the keys and user manual of company brands to their employees and create a platform for genuine Employee Branding! A piece content will be shared to all of our employees at Smarp to read and share forward to their own networks. This is a way for me to brand myself, while also representing our company. 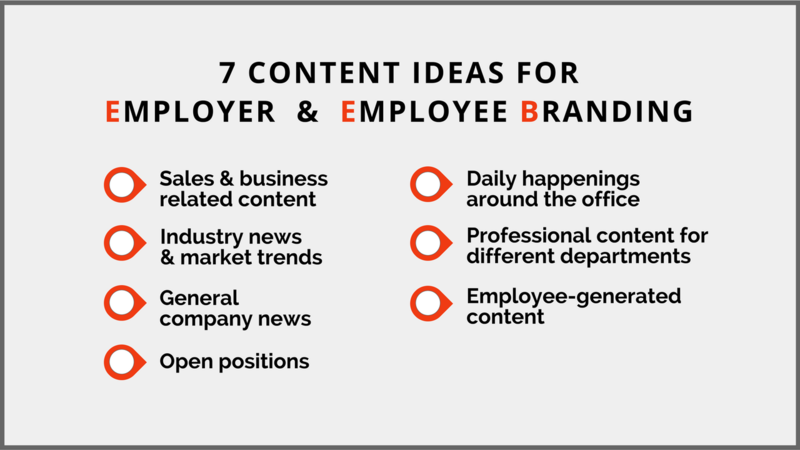 What Sort of Content Should You Have for Your Employees? Last but not least, you need to be able to figure out what type of content would your employees want to read and share because – let’s face it – there is no point of having this type of program if no one is interested. Variety and relevance are key, when it comes to the content. Most of your employees are not likely to engage a whole lot with content about stock exchange or the company's latest loan interest levels. You should let employees have a high impact on the actual content posted and, of course, provide them with the latest company news. Once people can influence the content by finding or writing that themselves, they are often more engaged, and this also eases your workload. It’s very important to have a healthy balance of your own content and external content – blogs, articles, industry news etc. More general company news, things that people need to know about! To sum up, employer branding, as most of the companies currently do it, should be tossed aside. Don’t create a polished, one-sided image of your company culture but include your employees into a true branding effort, while further engaging them to your company. Be authentic and hand over your brand to your employees!